Donald J. Trump has won the presidency of the United States, due to strong support among white voters. This is a remarkable turn of events, and it only gets more remarkable when you think back to how the Republican Party began its existence: fighting against the expansion of slavery. Over the past century and a half, though, the party of Abraham Lincoln has changed dramatically. It went from a party that was racially progressive for its times, to one that gets little support from nonwhite voters. And it went from a Northern-only party, to one that dominates the South. Here's how it happened. 1) The Republican Party was founded to oppose the "Slave Power"
Northerners feared the Kansas-Nebraska Act would let the "Slave Power" dominate the US. For the first half-century after the United States’ founding, slavery was only one of many issues in the country’s politics, and usually a relatively minor issue at that. The American South based its economy on the enslavement of millions, and the two major parties — which by the 1850s were the Democrats and the Whigs — were willing to let the Southern states be. But when the US started admitting more and more Western states to the Union, the country had to decide whether those new states should allow slavery or not. And this was an enormously consequential question, because the more slave states there were, the easier it would be for the slaveholding states to get their way in the Senate and the Electoral College. Now, the issue here wasn’t that Northern politicians were desperate to abolish slavery in the South immediately, apart from a few radical crusaders. The real concern was that Northerners feared the "Slave Power" — the South — would become a cabal that would utterly dominate US politics, instituting slavery wherever they could and cutting off opportunity for free white laborers, as historian Heather Cox Richardson writes in her book To Make Men Free. By 1854, in the face of intense controversy over whether Kansas and Nebraska would enter the Union as free or slave states, the Whig Party, which had been divided on the issue, collapsed. And remarkably quickly, a new, entirely Northern party sprang up to take its place. While not calling for abolishing slavery where it already existed, and certainly not calling for racial equality, this new party would be resolutely opposed to expanding slavery any further. Its supporters and sympathizers won an impressive share of seats in Congress, and it became known as the Republican Party. 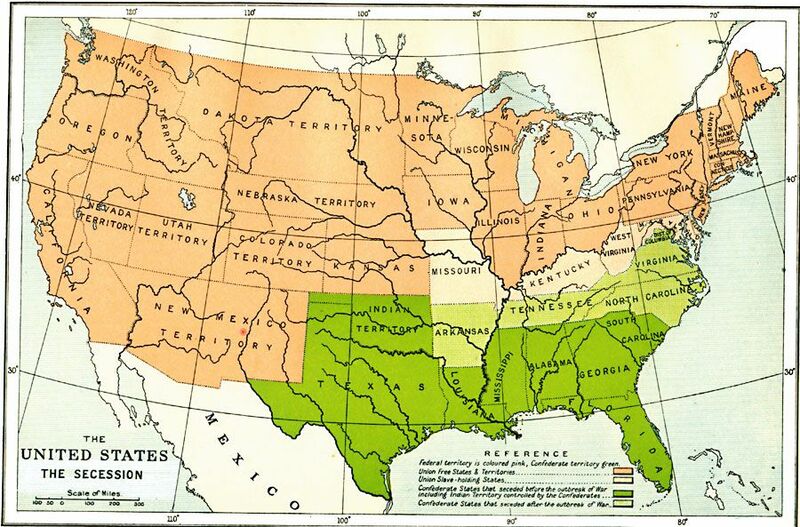 A map of when states (in green) seceded from the Union. In the Republican Party’s first six years of existence, slavery-related controversies pitting the North against the South grew more and more heated. Free-Soilers fought pro-slavery settlers in Kansas, the Supreme Court ruled in the Dred Scott case that black Americans couldn’t be citizens, and abolitionist activist John Brown tried to start an armed insurrection against slaveholders. Throughout all this, the Republican Party gradually gained strength in the North — and in 1860, the party's victories throughout the region were to win its little-known nominee, Abraham Lincoln, the presidency. 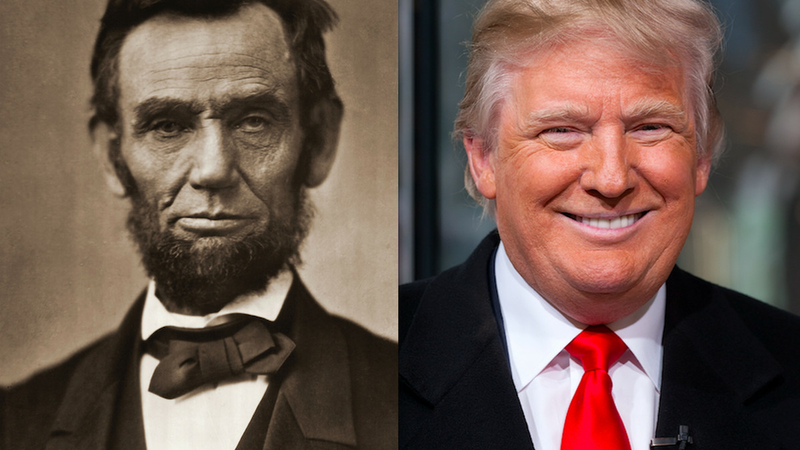 Now, Lincoln wasn’t the Great Emancipator yet; in fact, he continually promised that he wouldn’t interfere with slavery where it existed. But white slaveholders in the South still didn’t want to abide by the rule of the entirely Northern Republican Party. So in 1861, 11 states seceded to form a new nation, the Confederate States of America. And when Northerners concluded that they could not stand for secession, the Civil War began. At first, the North’s stated aim was merely to restore the South to the Union — not to free slaves. But as the war dragged on, strategic imperatives inexorably pulled Lincoln and the Republicans further toward abolition, as they sought to undermine their Southern opponents. Eventually, with the Emancipation Proclamation in 1863, Lincoln announced that all slaves in the Confederacy — but not the four slave states that didn’t rebel — would be free. And finally, as the war was winding down in early 1865, Congress approved the 13th Amendment, which banned slavery nationwide. The states ratified it later that year — the party founded to oppose slavery’s expansion had now abolished the institution outright in the United States. For a very brief period after the end of the Civil War, Republicans truly fought for the rights of black Americans. Frustrated by reports of abuses of and violence against former slaves in the postwar South, and by the inaction of Lincoln’s successor, Andrew Johnson, a faction known as the Radicals gained increasing sway in Congress. The Radicals drove Republicans to pass the country’s first civil rights bill in 1866, and to fight for voting rights for black men (though not yet women) at a time when such an idea was still controversial even in the North. Furthermore, Republicans twice managed to amend the Constitution, so that it now stated that everyone born in the United States is a citizen, that all citizens should have equal protection of the law, and that the right to vote couldn’t be denied because of race. And they required Southern states to legally enact many of these ideas — at least in principle — to be readmitted to the Union. These are basic bedrocks of our society today, but at the time they were truly radical. Just a few years earlier, the idea that a major party would fight for the rights of black citizens to vote in state elections would have been unthinkable. Unfortunately, however, this newfound commitment wouldn’t last for much longer. All this while, economic issues were growing more important to Republican politicians. 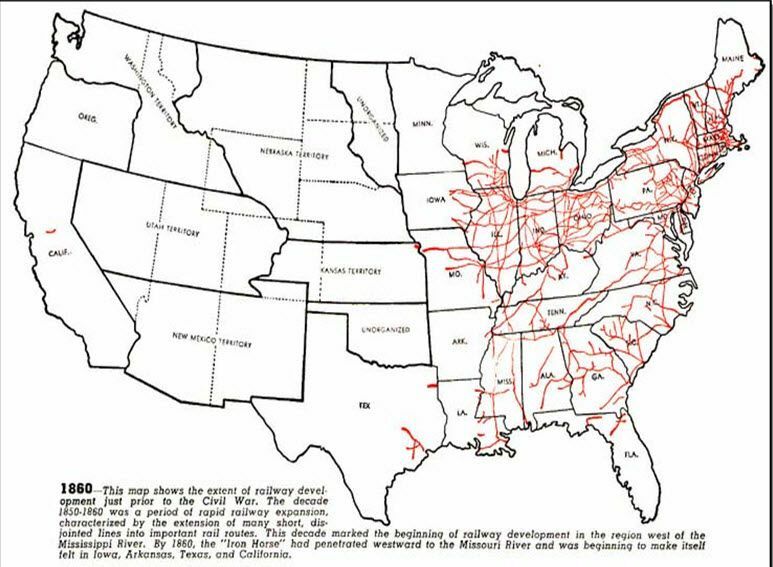 Even before the Civil War, the North was more industrialized than the South, as you can see from this map of railway lines. After it, this industrialization only intensified. And during the war, the federal government grew a lot bigger and spent a lot more money — and that meant people got rich, and owed their wealth to Republican politicians. The party’s economic policies, Cox Richardson writes, "were creating a class of extremely wealthy men." Gradually, those wealthy financiers and industrialists took more and more of a leading role in the Republican Party. They disagreed on many issues, but their interests — rather than the interests of black Southerners — increasingly started to become the party’s raison d’etre. 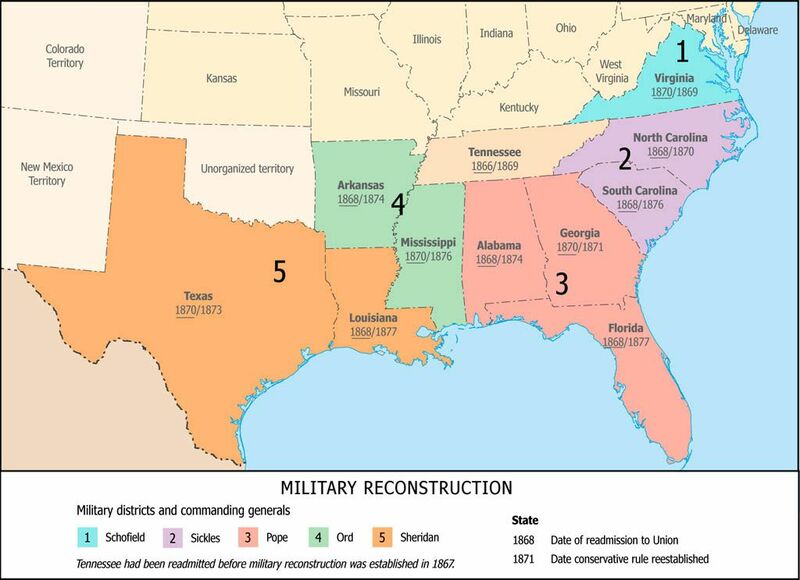 When the Reconstruction states were readmitted to the Union — and when they returned to "conservative" white rule. As mentioned above, Republicans had done a lot to help former slaves in the South, but many of the gains they had made existed more on paper than in practice, and others were in danger of being rolled back. And indeed, the backlash soon arrived. In the South, whites were dead set against what Radicals had done, and were willing to use violence to fight it. In the North, whites essentially thought they'd done more than enough for black Southerners at this point. Businessmen wanted their own interests to take center stage. Some intellectuals worried about the federal government squelching states rights. And public opinion turned — there was little appetite among white Northerners for an indefinite violent federal occupation of the South. By the mid-1870s, Republicans had given up. 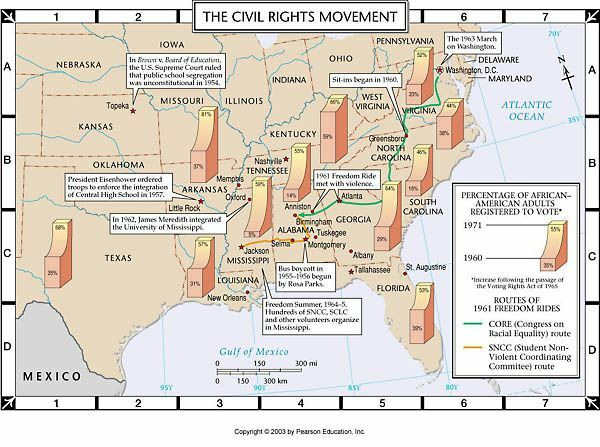 Southern states readmitted to the Union were now essentially left to their own devices on racial matters, and white conservative governments retook power, as this map shows. 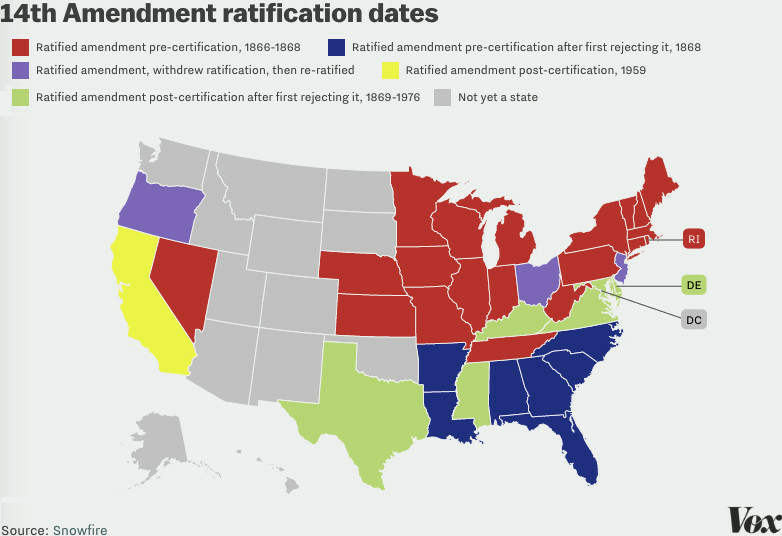 Many of these states essentially turned the new constitutional amendments, which were supposed to guarantee black citizens equal protection of the laws and voting rights, into jokes. But most Republicans no longer cared. The party had achieved its founding aim and had gone quite a bit further, since the Slave Power was now a thing of the past, and that provided a handy rationalization for not doing more. The cause of equal rights for black citizens would now essentially vanish from national American politics for decades. This map of New Deal projects across the country gives some indication of how dramatically government spending expanded during Franklin D. Roosevelt’s administration. We know the Republican Party today as a party that hates government interference with business. But as the 20th century started, progressive reformers who wanted to check the power of corporations and the wealthy had some support in both parties — and notably, from Republican President Theodore Roosevelt. That didn't last. When Democrat Woodrow Wilson won the presidency, the Republican Party turned sharply against many of his progressive reforms, which they came to believe expanded government’s power too much. When Republicans regained power and held it throughout the '20s, they were unmistakably the party of business. They thought prosperity for business was good for America and governed accordingly. That worked out quite well for them throughout most of the 1920s, but not so well when the economy crashed in 1929 and the Great Depression began. Then, Franklin D. Roosevelt and other Democrats were swept into power and began dramatically expanding the size and role of the federal government, in an attempt to fight the Depression and better provide for Americans (as this map of New Deal projects across the country makes clear). The Republicans left in Congress generally placed themselves in opposition to this newer, bigger government role. 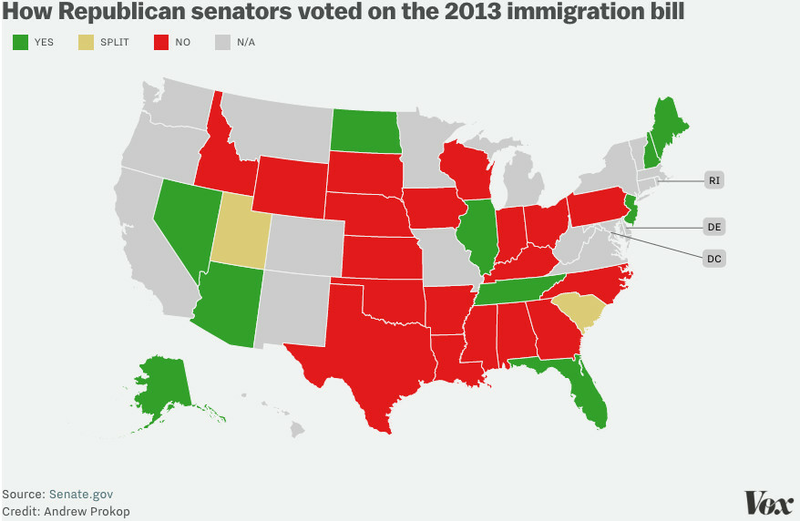 Map: Vox. Data: Barry Hirsch, David Macpherson, Wayne Vroman, "Estimates of Union Density by State." Roosevelt’s reforms also brought tensions in the Democratic coalition to the surface, as the solidly Democratic South wasn’t too thrilled with the expansion of unions or federal power generally. As the years went on, Southern Democrats increasingly made common cause with the Republican Party to try to block any further significant expansions of government or worker power. "In 1947, confirming a new alliance that would recast American politics for the next two generations, Taft men began to work with wealthy southern Democrats who hated the New Deal’s civil rights legislation and taxes," Cox Richardson writes. This new alliance was cemented with the Taft-Hartley bill, which permitted states to pass right-to-work laws preventing mandatory union membership among employees — and many did. Taft-Hartley "stopped labor dead in its tracks at a point where unions were large, growing, and confident in their economic and political power," Rich Yeselson has written. You can see the eventual effects above — pro-Democratic unions were effectively blocked from gaining a foothold in the South and interior West, and the absence of their power made those regions more promising for Republicans' electoral prospects. For more than half a century after the Civil War, black voters held strong loyalties to the Republican Party. But those loyalties began to wane with the depression and the New Deal, and by the time race returned to the forefront of national politics in the 1950s, the number of black voters who identified as Democrats was twice the number who identified as Republicans. Still, considering that the South had been Democratic for so long, it did briefly seem that it was possible the Republican Party would discover its roots as the party of civil rights for black Americans. It was Republican President Dwight D. Eisenhower who sent in federal troops to Arkansas to enforce the Supreme Court’s decision to desegregate schools, after all. But instead, it was a Democratic president — Lyndon B. Johnson — who signed the Civil Rights Act into law in 1964. Republicans gave the bill a good share of support in Congress, but the party’s presidential nominee that year, Barry Goldwater, argued that it expanded government power too much. As a result, Republicans went from losing black voters to losing them spectacularly. Ever since, it's been common for 80 percent or even more of black voters to support Democrats. House of Representatives districts represented by Republicans (red) and Democrats (blue). "I think we just delivered the South to the Republican Party for a long time to come," President Johnson said shortly after signing the Civil Rights Act, according to his aide Bill Moyers. And indeed, Sen. Strom Thurmond of South Carolina switched his party affiliation from Democratic to Republican specifically for this reason. Yet party loyalties take a long time to shake off, and the shift of white Southerners from being solid Democrats to solid Republicans was in reality more gradual. And while race played an important role in this shift, other issues played roles too. White evangelical Christians became newly mobilized to oppose abortion and take stands on other "culture war" issues, and felt more at home with the conservative party. 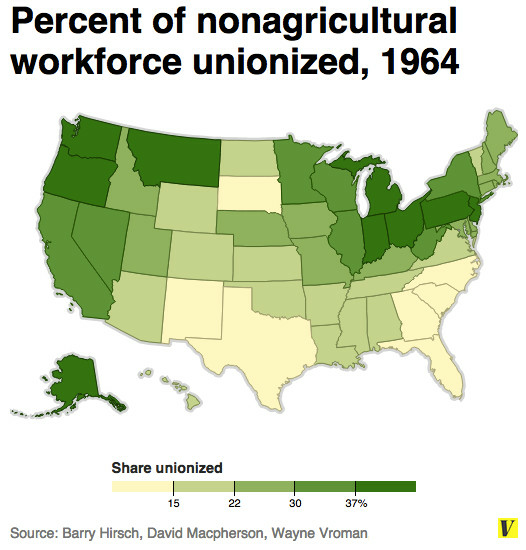 There was that suspicion of big government and lack of union organization that permeated the region. And talented politicians like Ronald Reagan promised to defend traditional values. Still, Democrats continued to maintain control of the House of Representatives for some time, in large part because of continued support from Southerners, as shown in this map by Jonathan Davis at Arizona State University. But in 1994, the revolution finally arrived, as Republicans took the House for the first time since 1955. 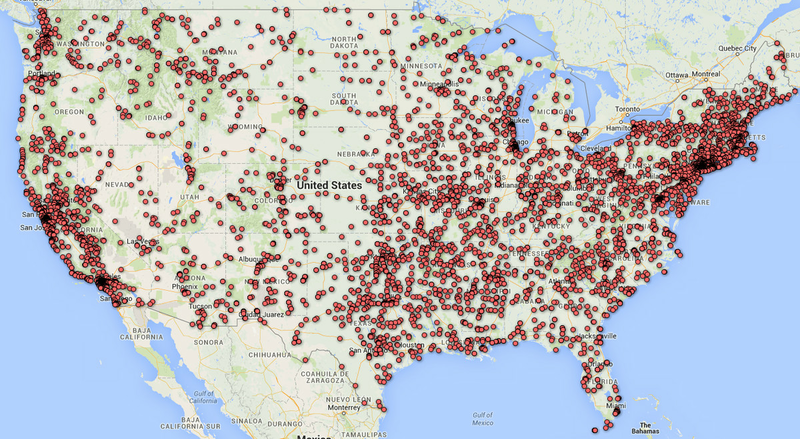 And many of the crucial pickups that made that possible came in the South. Republicans have controlled the House for 18 out of the 22 years since then, providing the party an important stronghold in national politics, as Tom Schaller has written. And the party's dominance of the white Southern vote has helped them dominate the region in both local and national elections — while also making the party more attuned to culture concerns of traditionally minded white voters. In recent decades, America has gone through a major demographic shift in the form of Hispanic immigration — both legal and illegal. The legal immigration has major electoral implications, as the electorate is becoming more diverse, and there is a new pool of voters that the parties can try to win over. Currently, the Democrats are doing a better job of it — this population growth already helped California and New Mexico become solidly Democratic states on the presidential level, and helped tip swing states Florida and Colorado toward Barack Obama too. But meanwhile, illegal immigration has also risen to the top of the political agenda. Democrats, business elites, and some leading Republicans have tended to support reforming immigration laws so that more than 10 million unauthorized immigrants in the US can get legal status. Many conservatives, though, tend to denounce such policies as "amnesty," and being "tough on illegal immigration" has increasingly become a badge of honor on the right. The bigger picture is that while the country is growing increasingly diverse, non-Hispanic whites are still a majority, and Trump's strong support among them was sufficient to deliver him the presidency. 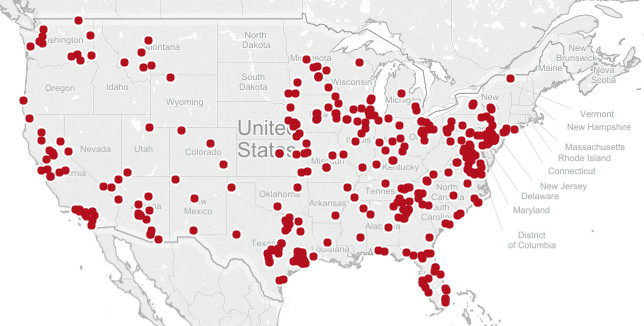 A map of Tea Party Patriots chapters. The Tea Party movement, which sprang into existence in the early years of the Obama administration, was many things. It was partly about opposing Obama’s economic policies — foreclosure relief, tax increases, and health reform. It was partly about opposing immigration — when Theda Skocpol and Vanessa Williamson interviewed Tea Party activists across the nation, they found that "immigration was always a central, and sometimes the central, concern" those activists expressed. But the Tea Party also was a challenge to the Republican Party establishment. Several times, these groups helped power little-known far-right primary contenders to shocking primary wins over establishment Republican politicians deemed to be sellouts. Those candidates didn’t always win office, but their successful primary bids certainly struck fear into the hearts of many other GOP incumbents, and made many of them more deferential to the concerns of conservative voters. Furthermore, many Republican voters also came to believe, sometimes fairly and sometimes unfairly, that their party’s national leaders tended to sell them out at every turn. Talk radio and other conservative media outlets helped stoke this perception, and by May 2015 Republican voters were far more likely to say that their party’s politicians were doing a poor job representing their views than Democratic voters were. This deep distrust of elites helped pave the way for Trump — and primary runner-up Ted Cruz, another candidate eager to heap scorn on party leaders. After the 2012 election, Republican leaders began to view the demographic changes in the country as a political crisis for their party. When Mitt Romney lost his bid for the presidency, he got blown out among Hispanic voters — exit polls showed that 71 percent of them backed Barack Obama. With Hispanic voters becoming a larger share of the electorate every year, GOP elites feared their chances of winning back the presidency would plummet. Their party looked like a party for white voters in an increasingly nonwhite country. So they came up with a plan. The party would change its tone on immigration, adopting more tolerant rhetoric, and it would also embrace immigration reform. In the Senate in 2013, old hands like John McCain and rising stars like Marco Rubio collaborated with Democrats on a bill that would give unauthorized immigrants a path to legal status. The final Senate roll call vote was 68-32 — with all 32 no votes, plus 14 yes votes, coming from Republicans. But a huge backlash from the Republican Party’s predominantly white base, which views the bill as "amnesty" for people who broke the rules, ensued. As a result, the bill died in the House of Representatives, never even being brought for a vote. The whole situation exacerbated GOP voters’ mistrust of their own party’s leaders, which had already been growing. It also helped cripple the presidential prospects of both Jeb Bush and Marco Rubio, who were closely identified with immigration reform. And it paved the way for Trump to launch his presidential candidacy on a platform of outright hostility toward unauthorized immigrants. 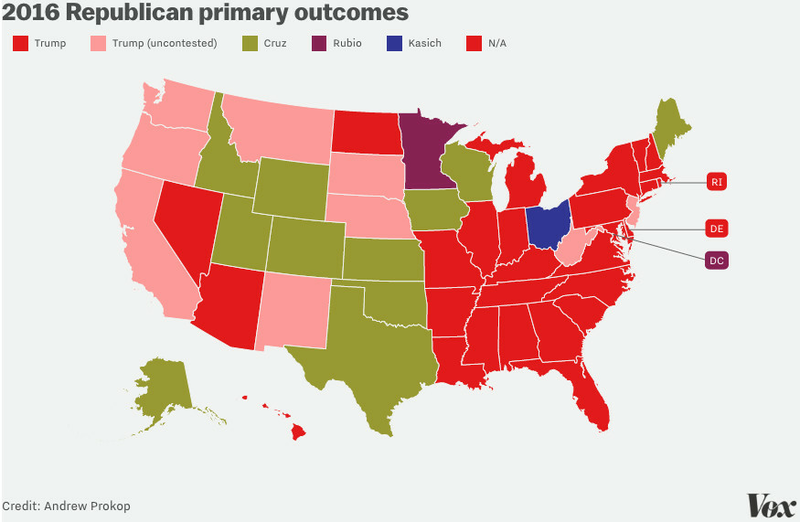 Trump’s success — depicted in the map of primary and caucus outcomes above — had many fathers. There was the inability of GOP elites to unite around anyone else, the endless coverage the media gave him, the mogul’s wealth, and his celebrity. And there were his twin geographical bases in the Northeast and the South. Still, at its core, Trump’s campaign appealed to Republican primary voters’ resentment and mistrust of party elites, as well as their demographic anxieties. And it did both so successfully that it made up for the fact that Trump really isn’t a traditional ideological conservative — perhaps revealing where the priorities of the party’s voters truly are. This article was originally published in July. Minor updates have been made to reflect the election results.